Overcoming failure is the ability to recover and become stronger as a result of dealing with challenging and difficult events that all of us experience in our lives. This audio is designed to help you to overcome failure by adopting a GROWTH attitude. 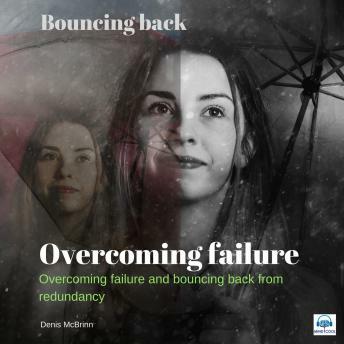 Chapter 2 of this audio looks specifically at how to bounce back from redundancy with practical advice on taking stock and planning your way forward. In our culture we have been conditioned to fear failure. We hate to make mistakes, dislike criticism and don't like to appear stupid in the eyes others. Whether it is in our careers, business, education, relationships, sport or in life generally, we don't want others to think of us as failures. In some cases we will deny or cover things up rather than admit mistakes. It's because everyone loves a winner. Everybody needs to love and to be loved. If we don't win then the fear is that we may not be enough and we won't be loved. The value of failure is in the learning and the growth that it provides. Without learning and growth, failure can be a destructive force in our lives. But don't let it. Get back up, Reframe the picture positively; identify your Options, find a Way forward, think appreciation and Work your socks off! With your GROWTH attitude, failure is just temporary and you will bounce back and achieve your potential. But remember it is jobs or roles that are made redundant not people. You can only become redundant if you see yourself as that job role. You may find yourself out of work for a while, but that does not have to mean the end of your working life.